Oiseaux Exotique (Exotic Birds) tapestry shows exotic birds in a tropical forest based on the work of Julien Deltil. The work of Deltil (1791-1863) shows the landscape of Brazil. 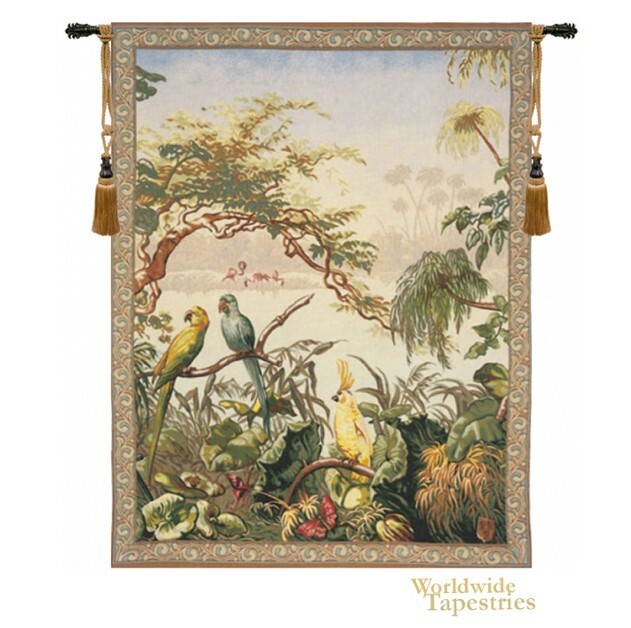 This birds in paradise tapestry or exotic bird tapestry shows parrots and galahs perched on tropical plants and trees, overlooking a serene lake. The foliage and fauna in this work are colorful and shows a lovely beauty of design. The French obsession of exotic lands and subjects in the 18th and 19th centuries, was fuelled by explorers returning from the Orient with tales and images of their travels. Here we see an idyllic landscape of fantasy and exotic fauna. This French "Oiseaux Exotique" tapestry is backed with a lining and has a tunnel for easy hanging. Note: tapestry rod and tassels, where pictured, are not included in the price.